As an engineer, I have always admired redundancy: just look at the Fourmilab server farm, firewall, or local network for examples of wretched (but highly reliable) excess in that regard. I was impressed, the evening after a major windstorm that littered the yard and driveway with leaves and branches from nearby trees, to spot this survivor on the wall near the main door to Fourmilab. While eight legs are factory equipment for spiders, he or she (probably she, since there is substantial sexual dimorphism in most spider species, and this was a big 'un) had lost three legs (whether in the recent storm, or in earlier mishaps or combat, there is no way to know), but appeared to be doing just fine. 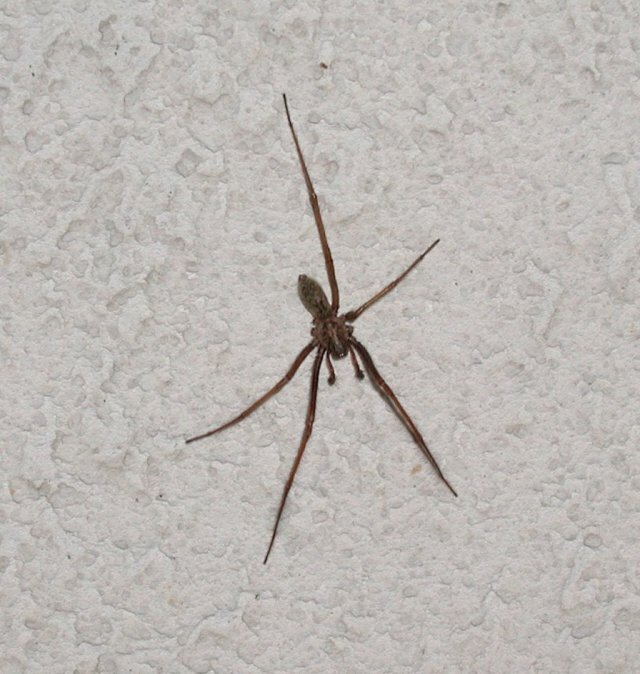 Spiders appear to be minimally affected by leg loss, although, in males, it may make them less attractive to arachnochicks. Spiders appear to have a limited ability to regenerate lost limbs, but once they reach adulthood and do not moult into larger and larger exoskeletons, this capacity is lost. Still, you've got to be impressed by a creature which can lose one more leg than you started out with and keep on going. I am virtually certain that when we finally tease out the neural wiring, weights, and feedback connections of this very simple control system, there will be multiple whack-the-forehead moments where we say “why didn't I think of that?”, and, if not deemed evidence of intelligent design, at least proof that blind hill-climbing evolution can produce designs which even the most intelligent observer can find extraordinarily difficult to reverse engineer.